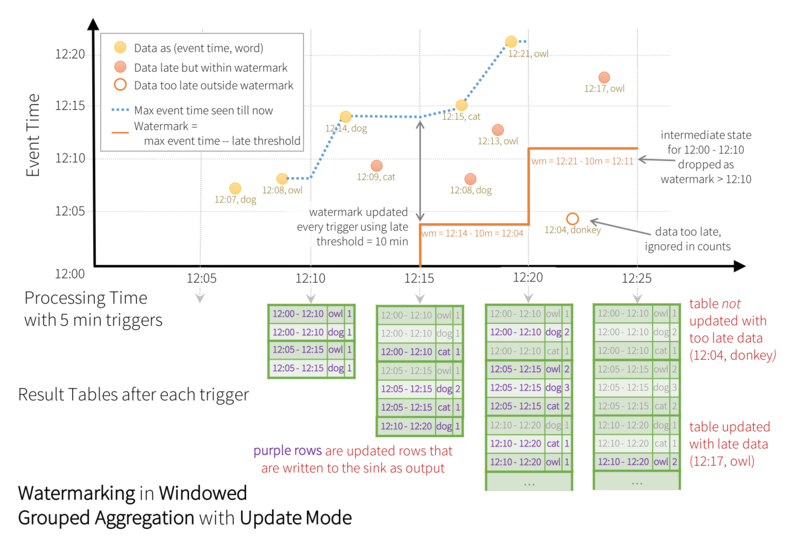 Structured Streaming is a scalable and fault-tolerant stream processing engine built on the Spark SQL engine. You can express your streaming computation the same way you would express a batch computation on static data. The Spark SQL engine will take care of running it incrementally and continuously and updating the final result as streaming data continues to arrive. You can use the Dataset/DataFrame API in Scala, Java, Python or R to express streaming aggregations, event-time windows, stream-to-batch joins, etc. 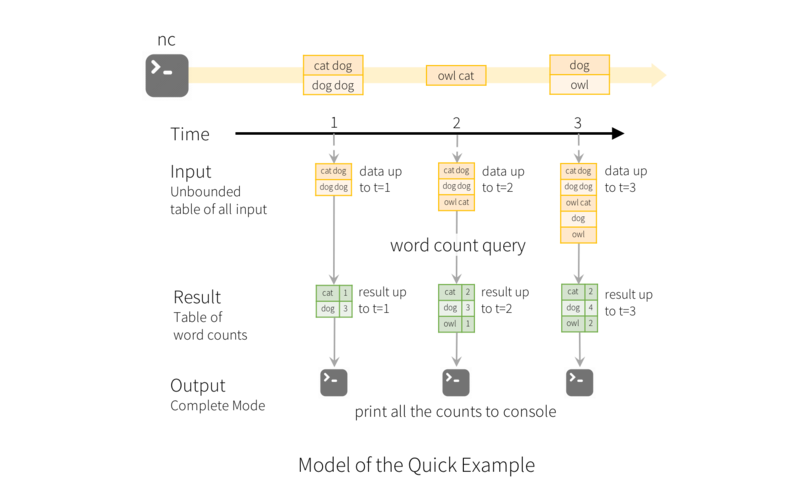 The computation is executed on the same optimized Spark SQL engine. Finally, the system ensures end-to-end exactly-once fault-tolerance guarantees through checkpointing and Write-Ahead Logs. In short, Structured Streaming provides fast, scalable, fault-tolerant, end-to-end exactly-once stream processing without the user having to reason about streaming. Delivering end-to-end exactly-once semantics was one of key goals behind the design of Structured Streaming. To achieve that, we have designed the Structured Streaming sources, the sinks and the execution engine to reliably track the exact progress of the processing so that it can handle any kind of failure by restarting and/or reprocessing. Every streaming source is assumed to have offsets (similar to Kafka offsets, or Kinesis sequence numbers) to track the read position in the stream. The engine uses checkpointing and write-ahead logs to record the offset range of the data being processed in each trigger. The streaming sinks are designed to be idempotent for handling reprocessing. Together, using replayable sources and idempotent sinks, Structured Streaming can ensure end-to-end exactly-once semantics under any failure. Partition discovery does occur when subdirectories that are named /key=value/ are present and listing will automatically recurse into these directories. 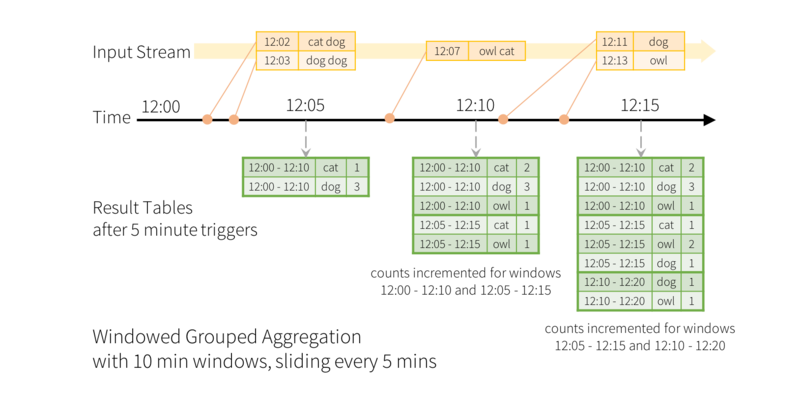 If these columns appear in the user-provided schema, they will be filled in by Spark based on the path of the file being read. The directories that make up the partitioning scheme must be present when the query starts and must remain static. For example, it is okay to add /data/year=2016/ when /data/year=2015/ was present, but it is invalid to change the partitioning column (i.e. by creating the directory /data/date=2016-04-17/). However, to run this query for days, it’s necessary for the system to bound the amount of intermediate in-memory state it accumulates. This means the system needs to know when an old aggregate can be dropped from the in-memory state because the application is not going to receive late data for that aggregate any more. 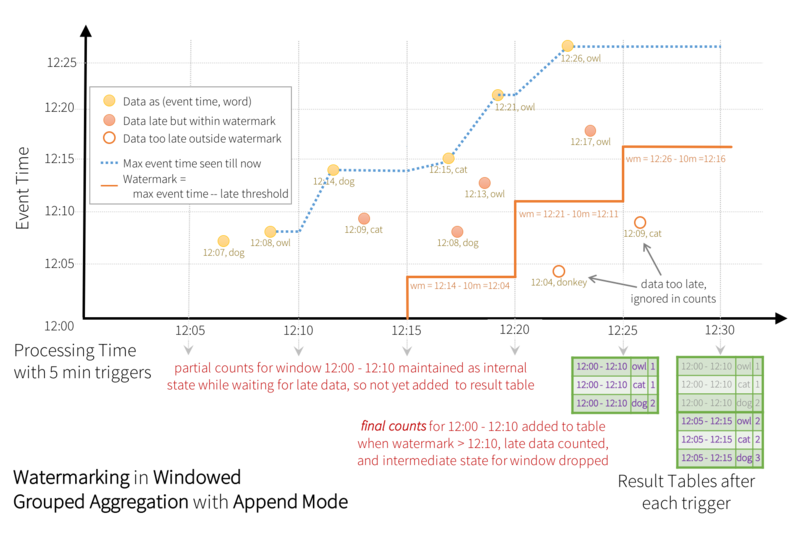 To enable this, in Spark 2.1, we have introduced watermarking, which lets the engine automatically track the current event time in the data and attempt to clean up old state accordingly. You can define the watermark of a query by specifying the event time column and the threshold on how late the data is expected to be in terms of event time. For a specific window ending at time T, the engine will maintain state and allow late data to update the state until (max event time seen by the engine - late threshold > T). In other words, late data within the threshold will be aggregated, but data later than the threshold will start getting dropped (see later in the section for the exact guarantees). Let’s understand this with an example. We can easily define watermarking on the previous example using withWatermark() as shown below. 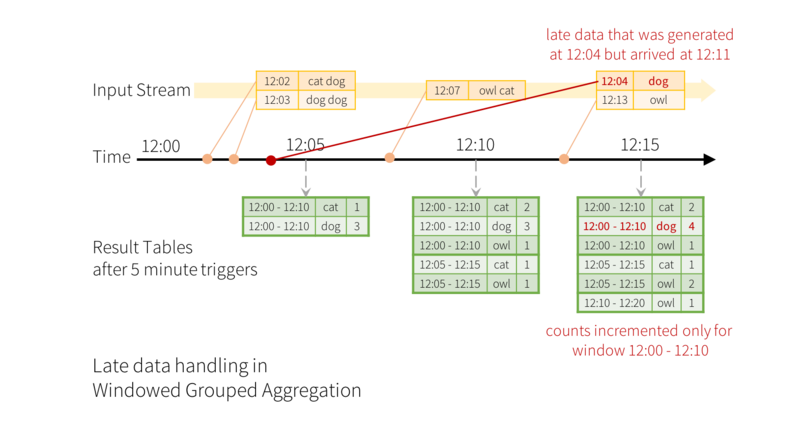 As shown in the illustration, the maximum event time tracked by the engine is the blue dashed line, and the watermark set as (max event time - '10 mins') at the beginning of every trigger is the red line. For example, when the engine observes the data (12:14, dog), it sets the watermark for the next trigger as 12:04. This watermark lets the engine maintain intermediate state for additional 10 minutes to allow late data to be counted. For example, the data (12:09, cat) is out of order and late, and it falls in windows 12:00 - 12:10 and 12:05 - 12:15. Since, it is still ahead of the watermark 12:04 in the trigger, the engine still maintains the intermediate counts as state and correctly updates the counts of the related windows. However, when the watermark is updated to 12:11, the intermediate state for window (12:00 - 12:10) is cleared, and all subsequent data (e.g. (12:04, donkey)) is considered “too late” and therefore ignored. Note that after every trigger, the updated counts (i.e. purple rows) are written to sink as the trigger output, as dictated by the Update mode. A streaming query can have multiple input streams that are unioned or joined together. Each of the input streams can have a different threshold of late data that needs to be tolerated for stateful operations. You specify these thresholds using withWatermarks("eventTime", delay) on each of the input streams. For example, consider a query with stream-stream joins between inputStream1 and inputStream2. However, in some cases, you may want to get faster results even if it means dropping data from the slowest stream. Since Spark 2.4, you can set the multiple watermark policy to choose the maximum value as the global watermark by setting the SQL configuration spark.sql.streaming.multipleWatermarkPolicy to max (default is min). This lets the global watermark move at the pace of the fastest stream. However, as a side effect, data from the slower streams will be aggressively dropped. Hence, use this configuration judiciously. The foreach and foreachBatch operations allow you to apply arbitrary operations and writing logic on the output of a streaming query. They have slightly different use cases - while foreach allows custom write logic on every row, foreachBatch allows arbitrary operations and custom logic on the output of each micro-batch. Let’s understand their usages in more detail. foreachBatch(...) allows you to specify a function that is executed on the output data of every micro-batch of a streaming query. Since Spark 2.4, this is supported in Scala, Java and Python. 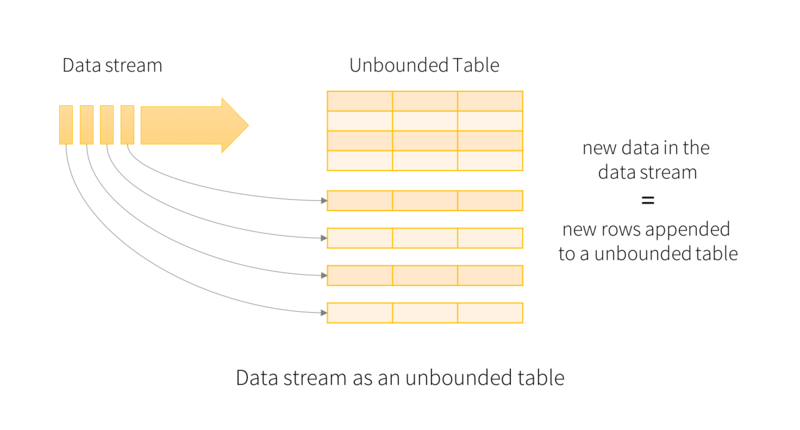 It takes two parameters: a DataFrame or Dataset that has the output data of a micro-batch and the unique ID of the micro-batch. R is not yet supported. With foreachBatch, you can do the following. Reuse existing batch data sources - For many storage systems, there may not be a streaming sink available yet, but there may already exist a data writer for batch queries. Using foreachBatch, you can use the batch data writers on the output of each micro-batch. Write to multiple locations - If you want to write the output of a streaming query to multiple locations, then you can simply write the output DataFrame/Dataset multiple times. However, each attempt to write can cause the output data to be recomputed (including possible re-reading of the input data). To avoid recomputations, you should cache the output DataFrame/Dataset, write it to multiple locations, and then uncache it. Here is an outline. Apply additional DataFrame operations - Many DataFrame and Dataset operations are not supported in streaming DataFrames because Spark does not support generating incremental plans in those cases. Using foreachBatch, you can apply some of these operations on each micro-batch output. However, you will have to reason about the end-to-end semantics of doing that operation yourself. By default, foreachBatch provides only at-least-once write guarantees. However, you can use the batchId provided to the function as way to deduplicate the output and get an exactly-once guarantee. foreachBatch does not work with the continuous processing mode as it fundamentally relies on the micro-batch execution of a streaming query. If you write data in the continuous mode, use foreach instead. If foreachBatch is not an option (for example, corresponding batch data writer does not exist, or continuous processing mode), then you can express you custom writer logic using foreach. Specifically, you can express the data writing logic by dividing it into three methods: open, process, and close. Since Spark 2.4, foreach is available in Scala, Java and Python. In Scala, you have to extend the class ForeachWriter (docs). In Java, you have to extend the class ForeachWriter (docs). In Python, you can invoke foreach in two ways: in a function or in an object. The function offers a simple way to express your processing logic but does not allow you to deduplicate generated data when failures cause reprocessing of some input data. For that situation you must specify the processing logic in an object. The function takes a row as input. # Open connection. This method is optional in Python. # Write row to connection. This method is NOT optional in Python. # Close the connection. This method in optional in Python. A single copy of this object is responsible for all the data generated by a single task in a query. In other words, one instance is responsible for processing one partition of the data generated in a distributed manner. This object must be serializable, because each task will get a fresh serialized-deserialized copy of the provided object. Hence, it is strongly recommended that any initialization for writing data (for example. opening a connection or starting a transaction) is done after the open() method has been called, which signifies that the task is ready to generate data. Method open(partitionId, epochId) is called. If open(…) returns true, for each row in the partition and batch/epoch, method process(row) is called. Method close(error) is called with error (if any) seen while processing rows. The close() method (if it exists) is called if an open() method exists and returns successfully (irrespective of the return value), except if the JVM or Python process crashes in the middle. Note: The partitionId and epochId in the open() method can be used to deduplicate generated data when failures cause reprocessing of some input data. This depends on the execution mode of the query. 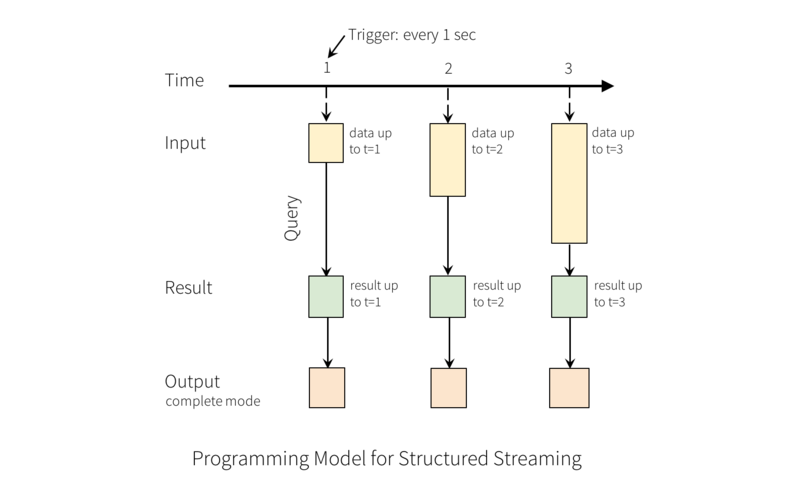 If the streaming query is being executed in the micro-batch mode, then every partition represented by a unique tuple (partition_id, epoch_id) is guaranteed to have the same data. Hence, (partition_id, epoch_id) can be used to deduplicate and/or transactionally commit data and achieve exactly-once guarantees. However, if the streaming query is being executed in the continuous mode, then this guarantee does not hold and therefore should not be used for deduplication. In case of a failure or intentional shutdown, you can recover the previous progress and state of a previous query, and continue where it left off. This is done using checkpointing and write-ahead logs. You can configure a query with a checkpoint location, and the query will save all the progress information (i.e. range of offsets processed in each trigger) and the running aggregates (e.g. word counts in the quick example) to the checkpoint location. This checkpoint location has to be a path in an HDFS compatible file system, and can be set as an option in the DataStreamWriter when starting a query. The term not allowed means you should not do the specified change as the restarted query is likely to fail with unpredictable errors. sdf represents a streaming DataFrame/Dataset generated with sparkSession.readStream.